Rural Revolution: SafeCastle Freedom Award Finalist Selection! Sorry for the delay in getting this out. What with the holidays, the complete sweep of the Lewis family by the norovirus, and preparations for a sales event this upcoming weekend, we've been either flat on our backs, in the bathroom, or standing behind a sander. Nevertheless, we have selected our winner for our part of the Safecastle Freedom Award and forwarded that selection to Safecastle LLC for inclusion in their contest. I know it's pretty standard practice to claim that it was a tough choice. But in this case, that was true. We received fifteen entries. Patrice and I re-read all of the entries and we each chose the three that we thought were the best, based on clarity, content, and best fit for the Safecastle requirements. We made our selection completely independently of each other, and on New Year’s Eve we put our lists together. Each of us was prepared to defend our choices, assuming that we'd have multiple selections in common. After all, we've been married for 21 years, worked side by side for most of those years, and have very similar ideas of preparedness and self-sufficiency. So it would be natural that our choices would be similar. In point of fact, in each of our three choices, there was only one common essay. But since we enjoyed everyone's entries, we've decided to send everyone who participated a Rural Revolutionary tankard by way of thanks. I'll be emailing each of you soon as I can to get a mailing address. Delivery will be in about six to eight weeks, as I still have to make the things and I'm kind of backed up at the moment. Glad you have made it. Thank you so much, Don and Patrice! As I told you by email, I'm more excited about the tankard than anything!! Oh, and you asked what an "ado" is. It's a flightless bird from New Zealand, now extinct, which is why we say "without further ado", because of course there are no more of them. And "Much Dodo About Nothing." Congrats to the winner. I presume the winner is Maria Stahl. So, without further ado....(If there is to be no further ado, then the sentence should end after "ado." Right?) I'm confused. Don & Patrice, it's very generous of you to provide tankards to each entrant. You show a lot of class by doing so. Too bad I can't say the same about SafeCastle. They should have stuck to their original prize list, rather than change it after the contest was underway. 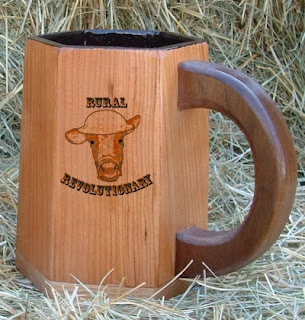 Are you going to have a few extra laser engraved tankards made that you will sell?